See, the tree is gone. Of course there are many good reasons to cut down a perfectly healthy tree. I once had a neighbor who regularly complained to me how "dirty" the trees on his property were. He wanted to cut them all down. Well, I think humans are kind of "dirty" too. If you live on Long Island, chances are you spend a lot of time in a car. It is a heavily automobile-dependent culture. 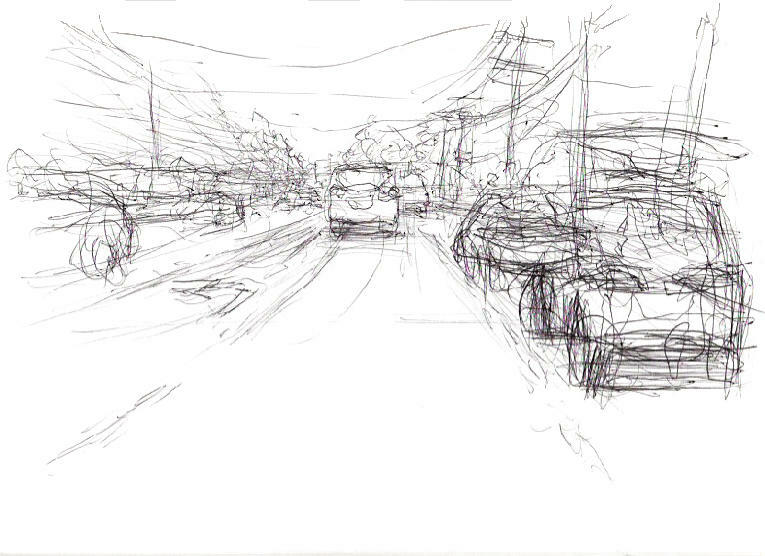 The roads are swollen with cars at all times of day, and a pedestrian is only an obstacle to a driver. I have taken to sketching while in the car (no mom, only as a passenger). 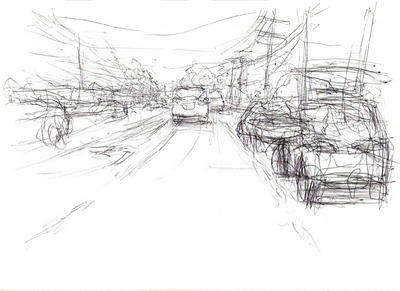 It's interesting trying to draw moving objects and shifting scenery. 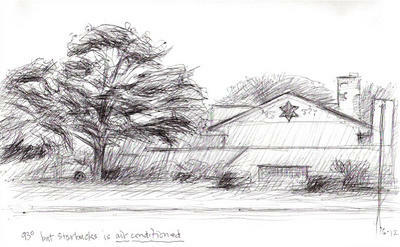 The Jewish Community Center across from one of my Starbuck haunts in Levittown. This nice tree was cut down a few weeks after I drew it. I better be careful what I draw. Why are we drinking hot coffee in 95 degree temperatures? Hmmm. Kay (on the left, without chin) and I found a Starbucks with "outdoor seating": a single table and 2 chairs on a tiny square of concrete. Thoughtfully, they also installed a speaker nearby from which 80's music blares. 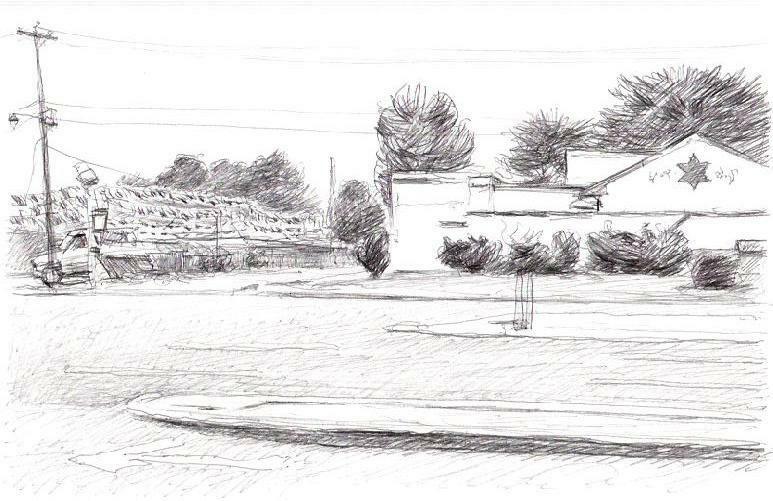 Nevertheless, we enjoy the fine landscape of evenly spaced juniper bushes, car wash parking lot and self-storage building. My friend Babette took this at the opening of my show last March at Aurora Gallery in Vancouver WA. 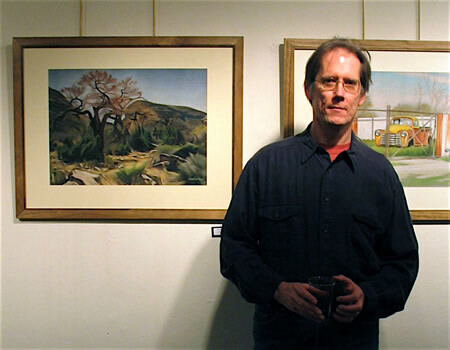 On the left is "Cottonwood in Last Chance Canyon", depicting a favorite place about an hour's drive northwest of Carlsbad, New Mexico. Kay and I hiked there frequently on the weekends. It was a peaceful and beautiful spot. It's a place that has been inhabited and/or visited by native peoples for a long long time. On the right is a partial view of "Chevy", another quiet rustful landscape in Carlsbad. This truck was just to the left of "Continental", which was just to the left of "Freight Cars". I did make almost a complete circle of drawings from this spot.